Finding the appropriate body repair shop near you in Mesa can be tough. But with Excel Collision and Glass Centers, we make sure that your car is restored to its proper state after years of overuse, damage, or an unfortunate collision. Owner Tim Stone is dedicated to providing you with trained experts to take care of your vehicle. The professionals at Excel Collision work to provide you with excellent communication and quality workmanship for your vehicle. We pride ourselves in a job well done and work to ensure that our customers are pleased with the work we have displayed for each and every vehicle we restore. At Excel Collision and Glass Centers, we have over forty years of experience in the auto repair industry and have five star reviews on Google, Yelp, and the Better Business Bureau to back our top quality standards. Yes, certification matters. You may get the job done cheaper down the street, but who is to say how well it is done. When working with a certified Mesa collision center such as Excel Collision and Glass Centers, you know the technicians have received the proper training and are held to the high standards of the car manufacturer. This also means they have the specialized equipment to properly repair the vehicle in question. The team with Excel Collision in Mesa has earned many distinctions and certifications from international car makers such as Honda, Toyota, VW, Hyundai and others. Come and experience the Excel Collision difference today. In our East Mesa Collision Center, we provide affordable auto body repair for minor fender benders and major collision damage. Our experienced team of certified East Mesa auto body technicians can repair major collision damage, replace fenders, bumpers, match paint color to your existing car, but also knows how to look for damage that is not visible to the naked eye. Only by ensuring that your car is properly cared for inside and out, you have a car that will keep you safe on the road. Our certified, local East Mesa auto body mechanics can help uncover hidden damage and repair them fast and affordable to ensure that your car is as safe as the day you brought it home from the dealership. As of the latter part of 2014, Toyota, GM, and Ford have moved into aluminum body parts in many of their vehicles including the Ford F150, the most popular truck in the United States. As aluminum becomes more widely used in more vehicles, the need for aluminum repairs will become more widespread, as will the need for Mesa body shops in possession of the equipment and certification to repair them correctly. The first thing a collision repair shop needs in order to be able to repair aluminum vehicles is an isolated work area. Steel and aluminum repairs cannot be mixed or it will result in future corrosion. Even a tiny particle of steel, if it drifts into an aluminum repair, can cause galvanic corrosion that can eventually weaken its protective coatings and start rusting in a short period of time. Remember that fender bender from last year? Did you ever get it checked out? Come and schedule an appointment today. Even if there is no visible damage, chances are that there is damage hiding in your auto’s body. 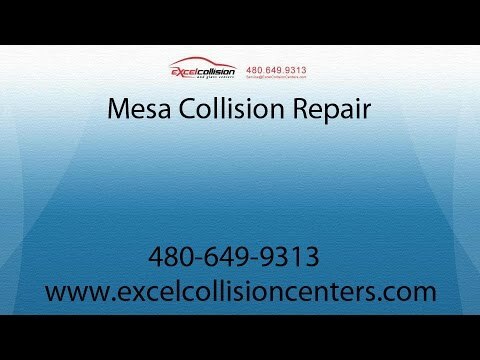 Excel Collision has the experienced Mesa collision repair technicians and the affordable rates that allow you to have your car checked out properly. Only a car in top shape, is a safe car. We are not talking about mismatched door colors or anything else cosmetic; hidden damage can have a serious impact on the health of your car and thus put you and your loved ones at risk the next time you hit the road. Act now! Excel Collision and Glass Centers take greats pride in the quality of our workmanship and are a manufacturer certified by Ford, GM, Honda, Acura, Nissan, Subaru, Infiniti, Hyundai and Kia. We also excel at customer service and satisfaction that brings customers back again. From bumper to bumper, from the moment of the accident, until you pick your car up in our shop, we’ve got you covered. Being in a fender bender or a collision is bad enough. The team with Excel Collision does its best to make things just a bit easier for you. If your car is un-driveable after an accident, we can tow it to our shop so you don’t have to worry about how to get it there. And while we are working on your vehicle, you can make use of one of our rental cars so you can go where you need to go. Great customer service to us is not only getting your car back on track, but helping you resume your daily life. We’ve got you covered. East Mesa Collision Technology – What’s It All About? Am I Obligated to Fix My Mesa Car after I File an Insurance Claim? While repair technicians in those type of auto body shops may have no formal education in collision repair, technicians in a manufacturer certified collision repair center are required to complete specific training programs that require education, knowledge, repair repetition, and on-site training to become manufacturer certified. In addition, an auto body shop must possess the advanced tools required, meet on-site inspection requirements, participate in continuing education programs and pass an annual recertification. These costs can be staggering, so many auto body shops find themselves unable to compete. Many of today’s cars are made incorporating compounds such as aluminum and carbon fiber, as the government continues to push for safer vehicles that also get better gas mileage. BMW, Audi, Honda and others have already been using aluminum components in their vehicles and the trend is growing. We do accident and collision repair for the entire east valley, including residents in our home city of Mesa. We are located in the 85210 Zip code, and serve 85212, 85213, 85215, 85233, 85234, 85281, 85283 85120, 85142, 85201, 85202, 85203, 85204, 85205, 85206, 85207, 85208, 85209. What Are You Close To In Mesa? We are located close to the 60 freeway and the 101 freeways in West Mesa, close to downtown Mesa. In East Mesa, we are located close to the 202 and 60 freeway. We are close to MCC, Superstition Mall, Alta Mesa, and near many other major landmarks in the city. Excel Collision has the experienced Mesa collision repair technicians and the affordable rates that allow you to have your car checked out properly! Back in the days of “shade tree mechanics” there were similar types of Mesa auto body shops. Many of these auto body shops are still around today in Mesa. Unfortunately, advancements in the auto manufacturing industry have necessitated new requirements for collision repair. Today it’s estimated that only about 15% of the collision centers in Mesa meet these requirements. Advancements in construction, components, and materials in today’s vehicles necessitate the use of advanced repair procedures that many collision repair centers are not trained in, along with the use of new and advanced tools that may be unaffordable to some auto body repair shops.